Valentine's wedding centerpieces showcased in pictures help couples choose decorations for their Valentine's day wedding without resorting to predictable hearts or Cupids. Pictures of wedding centerpieces for this holiday reveal rose petals, confetti, Valentine's Day candy, chocolates, candles, pearls, and even novelty cards used to create these romantic masterpieces. Let guests write wedding wishes on love notes. 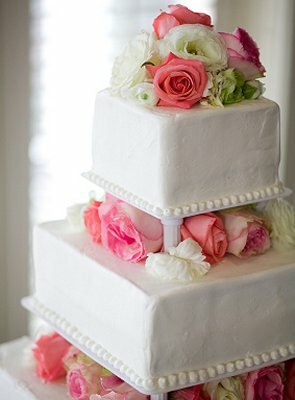 While hearts, red roses, and love struck Cupids are the most popular Valentine's Day decorations, many couples prefer more unique wedding decorations. Peonies are a romantic flower with a vintage feel. Sprinkle love confetti on silk table covers. Valentine's candy is a yummy centerpiece and fun favor. Exotic perfume jars can hold your love potion. Add pine boughs to roses for this winter holiday. A lace heart doily adds instant Valentine's Day appeal. A single rose is classically elegant. Origami flowers are a unique twist on classic decorations. Wedding truffles in a wine goblet are deliciously romantic. Square centerpieces are easy and trendy. Teddy bear weddings are whimsical centerpiece options. Looking for more romantic options? Check out the romantic wedding pictures slideshow.